I had an hour for lunch and decided to grab some tacos in Lincoln Heights. Lincoln Heights is a small community just east of downtown LA and by all accounts quite a taco haven. Heading east on Hill St I turned on the radio to hear Steve Jones from indie 103.1 singing some song about him being a fat sod and not getting any birds. 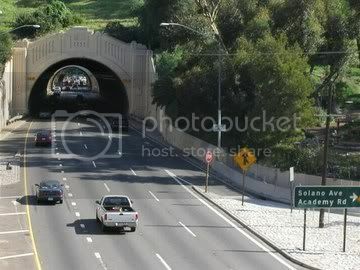 I must have been distracted by the fat sod on the radio cuz the next thing I know I'm on the 110 north heading through the tunnel towards highland park. It turns out that Hill St runs straight into the 110. Before this taco hunt I would rarely venture east of downtown for lunch and would usually stick to downtown eateries. I've come to realize that the downtown freeway on and off ramp design is FUBAR. So there was a change of plans and with time being a factor I decided to pull off the freeway in highland park and stop at the first taco truck I saw. Driving west on figueroa it didn't take long for a taco truck to come into view. I noticed a taco truck pulled up in front of a Foods for Less market at figueroa and 51st st.
As I walked up to the taco truck I noticed that the truck didn't have a name. I know it's bad luck to not name a boat but I'm not sure if the same rule applies to taco trucks. 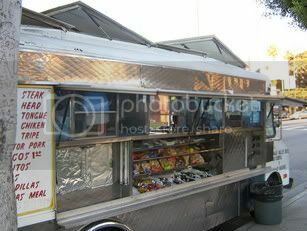 I dont think it should but if I had a taco truck I'd give it a name. "your taco truck doesn't have a name" I said to the girl at the window. I was going to suggest a name. Perhaps Bandini's tacos but instead I ordered 3 asada tacos con todo and popped open a lime jarritos. My tacos came on two large sized corn tortillas with a tomatillo and chile arbol salsa. I'm more of a fan of a classic taqueria red salsa but this salsa was pretty good. It didn't have any kick to it but it had some interesting flavors that went good with the beef. As far as the asada It was stewed beef and quite tender. It was different from pretty much every asada taco I've had on this taco hunt in that it wasn't grilled or broiled and had a soupy texture to it. I enjoyed it but I wasn't overwhelmed. I'm hard to please tho and I'm stubborn when it comes to a great taco. I like a taco and a hot sauce to make me sweat a little. I think I will make it a goal of mine to try every taco truck in Highland park before spring. Like a taco conquistador I will march through this interesting taco town and devour their tacos and make love to their women. ok maybe not the make love part but i'm gonna eat alot of tacos. finally exploring highland park =) as you've been hunting in the west (as in la) i visited a few highland park taco trucks (from jonathan gold's 'nueva york' article) and i recommend el pique (i had yummy chorizo taco) and la estrella (the truck whereas the stand is where i went last time with the al pastor). el pique is on york and 53rd, and la estrella is 54th. i know you know la estrella but i'm not sure whether it's the stand or the truck. I found another place in the South Bay area that is pretty good. Not sure where the others are located at. 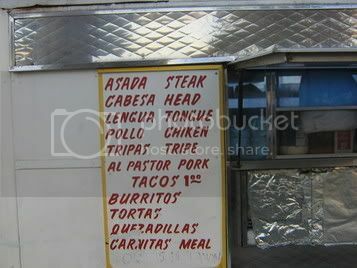 Asada was decent but the pastor was better. 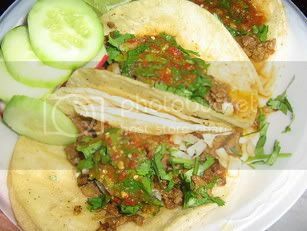 Seems like use homemade tortillas but have yet to verify it but the taste and texture are there. Tortas, burritos, and seafood on the menu too. I'd give it 3 1/2 to 4 tacos rating. thanks for the info on el pique. I need to get out to highland park again. i've been to the la estrella stand before but not the truck. Owned by the same people? thanks for the southbay rec. I'll be in the southbay this weekend so i'll try to check it out. i'll ask la estrella next time i go to either one of them and get back to ya. Dude, you can't go "west" on Figueroa. You can go either north or south, basically. Okay, maybe not dead true north, maybe the road veers off northwesterly a bit here and there, maybe. But basically you're headed north.